August Svensson was born July 24, 1856, in Stenbäck, Sweden, and died December 29, 1926, in Karsjö, Sweden, at age 70. He is the son of Unknown. Ingrid Larsdotter was born January 23, 1865, in Fröbbestorp, Kalmar lan, Smaland, Sweden, and died January 3, 1958, in Glosebo, Sweden, at age 92. She is the daughter of Lars Pehrsson of Fröbbestorp, Torsas, Kalmar lan, Småland, Sweden, and Maria Månsdotter of Stuvehyltan, Sweden. 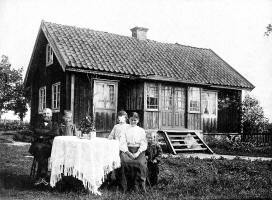 August Svensson and Ingrid Larsdotter were married December 8, 1885, in Sweden. Ida Maria Svensson: Born November 2, 1885, in Stenbäck, Sweden; Died April 28, 1964, in Tånghult, Sweden (age 78). Married September 24, 1909, in Sweden to Karl Olof Persson: Born on April 3, 1882, in Ramdala, Sweden; Died July 7, 1984, in Tanghult, Sweden (age 102). Karl Gideon Svensson: Born September 12, 1887, in in Torsas, Kalmar Co., Sweden; Died May 18, 1980, in Miles City, Custer Co., MT (age 92). Buried in Calvary Cemetery, Miles City, Custer Co., MT. Married December 24, 1917, in Miles City, Custer Co., MT, to Barbara Mary Kary: Born April 24, 1889, in Landau, Beresan, Odessa, Russia; Died December 25, 1986, in Friendship Villa, Miles City, Custer Co., MT (age 97). Buried in Calvary Cemetery, Miles City, Custer Co., MT. Hilda Amalia Svensson: Born August 30, 1889, in Hallagarde, Sweden; Died October 30, 1902, in Karsjö, Sweden (age 13). Per Vigert "Pete" Svensson: Born February 20, 1892, in Hallagarde, Sweden; Died Killed in an accident in Sweden. Sven Gottfrid Svensson: Born January 20, 1894, in Hallagarde, Sweden; Died December 24, 1894, in Gullaboås, Sweden (age Infant). Alma Kristina Svensson: Born March 13, 1896, in Gullabo, Sweden; Died November 7, 1901, in Karsjö, Sweden (age 5). Josef Bernhard Svensson: Born March 17, 1898, in Karsjö, Sweden; Died November 6, 1901, in Karsjö, Sweden (age 3). 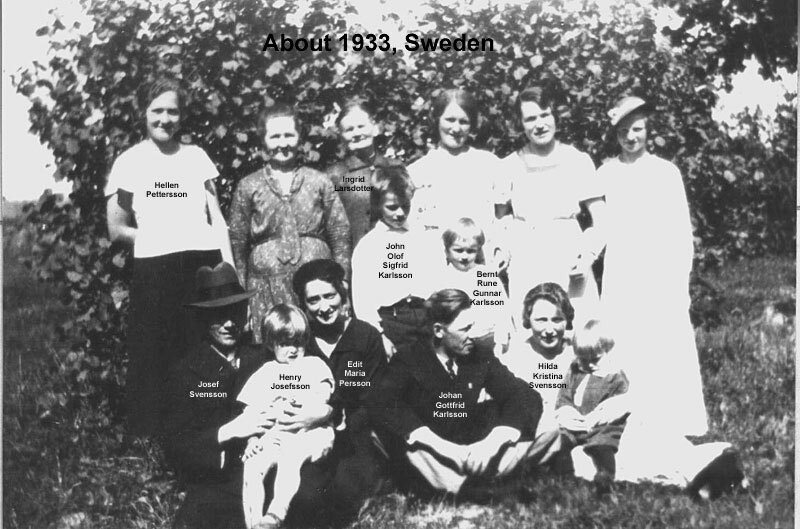 Albert Gottfrid Svensson: Born May 21, 1900, in Karsjö, Sweden; Died November 9, 1901, in Karsjö, Sweden (age 1). Josef Gottfrid Svensson: Born July 28, 1902, in Karsjö, Sweden; Died June 13, 1904, in Karsjö, Sweden (age 1). Hilda Kristina Svensson: Born February 20, 1904, in Karsjö, Sweden; Died October 2, 1986, in Kyrkebo, Sweden (age 82). Married February 7, 1925, in Sweden to Johan Gottfrid Karlsson: Born May 22, 1891, in Gullabo, Sweden; Died June 19, 1980, in Kyrkebo, Sweden (age 89). Josef Gottfrid Svensson: Born November 14, 1905, in Karsjö, Sweden; Died August 17, 1988, in Nybro , Sweden (age 82). Married May 30, 1931, in Swede to Edit Maria Persson: Born June 16, 1907, in Qvilla, Sweden; Died October 24, 1974, in Emmaboda, Sweden (age 67). Sven Albert Svensson: Born August 3, 1908, in Karsjö, Sweden; Died July 12, 1965, in Gullabo, Sweden (age 56). Married August 8, 1931, in Sweden to Hellen Viktoria Pettersson: Born 1911 in Sweden; Died 2000 in Sweden (about age 89). August Svensson was born July 24, 1856, in Stenbäck, Sweden. Ingrid Larsdotter was born January 23, 1865, in Fröbbestorp, Kalmar lan, Smaland, Sweden. 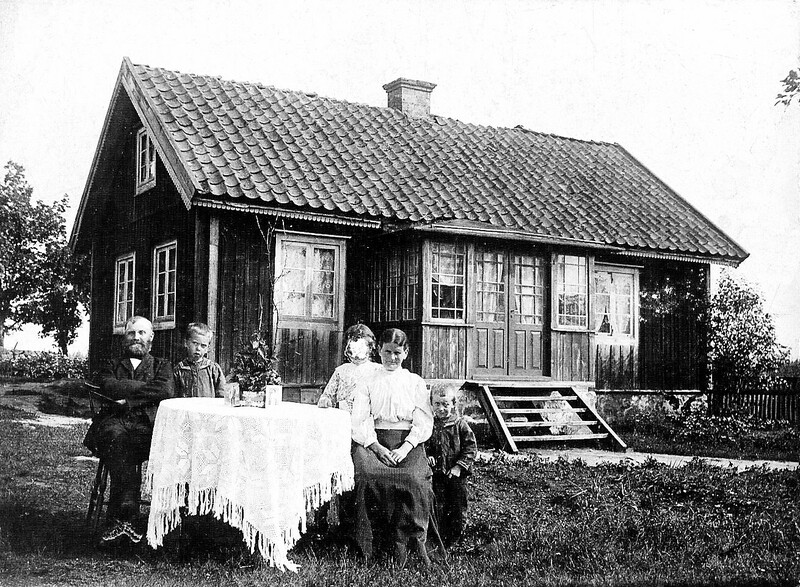 About 1910 in Karsjö, Sweden: August Svensson, Josef Svensson, Hilda Svensson, Ingrid (Larsdotter) Svensson, and Albert Svensson. Apparently Hilda did not like her picture, since her image has been defaced! The house was torn down about 1952. 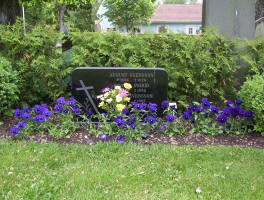 August Svensson died December 29, 1926, in Karsjö, Sweden, at age 70. Ingrid (Larsdotter) Svensson died January 3, 1958, in Glosebo, Sweden, at age 92. Ingrid (Larsdotter) Svensson and family, early 1930s, Sweden. 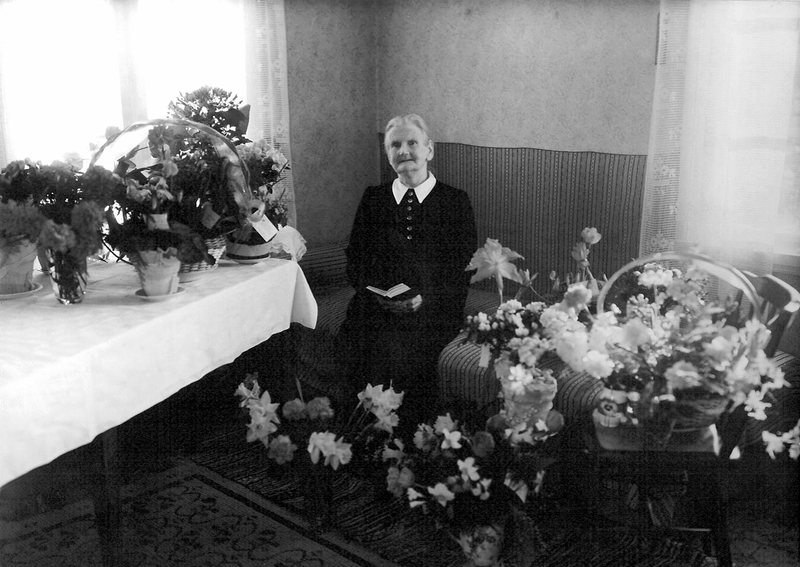 Ingrid (Larsdotter) Svensson on her 90th birthday, January 23, 1955, Sweden. She was living with her son, Albert and daughter-in-law, Hellen Viktoria Pettersson.